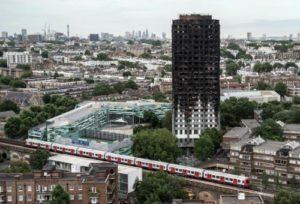 The RIBA has said it has ‘serious concerns’ about the direction of the post-Grenfell review of Building Regulations, warning that its recommendations will not bring about the changes needed. 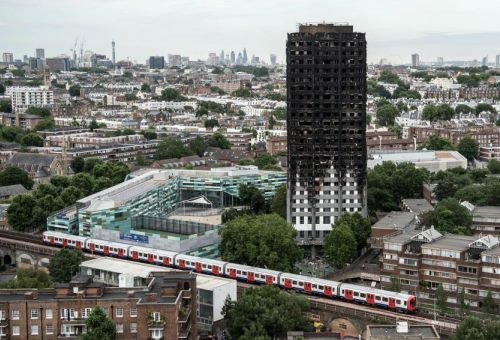 The institute said the Independent Review of Building Regulations and Fire Safety, led by Judith Hackitt and responding to the Grenfell Tower fire, had overlooked the RIBA’s calls to ban flammable cladding, fit sprinklers in existing housing blocks and ensure a second means of escape for all high-rise residential buildings. In December the RIBA criticised Hackitt’s interim report, claiming it had shied away from ‘introducing immediate and effective changes’. Now, following the second phase of the review, which included the RIBA’s input into two working groups on design, construction and refurbishment and competence, the institute’s expert panel says it fears ‘the current set of proposals under consideration by Hackitt will not provide clarity for professionals or deliver assurance for the public’. The RIBA has now written to Hackitt and housing secretary Sajid Javid (see attached), urging an immediate consideration of the recommendations laid out by the RIBA before the final report is due in May. RIBA past president Jane Duncan, who chairs the institute’s Expert Advisory Group on Fire Safety, said: ‘The RIBA has engaged closely with [Hackitt] and her review and we welcome many of the suggestions made in her interim report to strengthen the building control system. ‘However, we fear that the current set of proposals under consideration overlook simple but critical changes that would provide clarity for professionals and most importantly, would help protect the public. 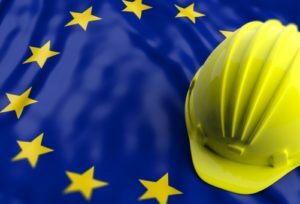 The UK’s Construction sector had an underwhelming Q4 2017 with only a 2.26% growth in sales and a 2.28% rise in failed businesses, according to the Creditsafe Watchdog Report. 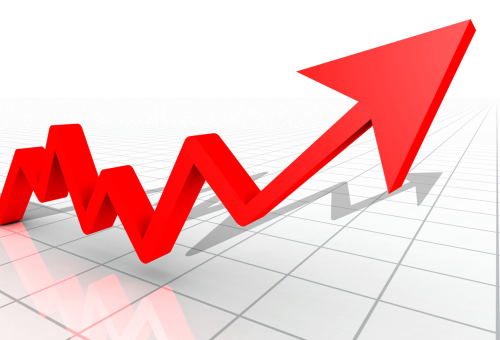 The report tracks quarterly economic developments across construction and 11 other sectors. The report showed that the number of high risk businesses had increased by 12.15% on the previous quarter, and the number of very low risk firms had seen a drop from 58,261 to 55,734 (4.34%). In addition, companies’ bad debt, the volume owed to the sector, had risen from £9,136,325 to £12,735,137, a 39.39% increase on Q3, despite a fall of 40.41% compared to Q4 2016. However, the number of companies affected by bad debt fell by 14.94%, meaning the average amount owed to each business in the construction sector saw 63.87% increase. Total employment rose by 14.40% from Q3 to Q4, and by 32.21% compared to the start of 2017. RIBA has awarded the 2017 Stirling Prize to Hastings Pier designed by dRMM Architects. RIBA Stirling Prize, now in its 22nd year, is awarded annually to the UK’s best new building. Hastings Pier, on East Sussex coast, overlooks the English Channel and has a history that dates back to 1872. For many years it was a popular pleasure pier famous for musical acts, but its recent past has been much more precarious. Neglected for years, it closed in 2008 following storm damage, and in 2010, faced destruction when a fire ravaged the entire structure. Buoyed by the help of the Heritage Lottery Fund, a RIBA design competition attracted entries from around the world. London-based architects dRMM won the competition and immediately set about close consultation with locals and stakeholders. The 19th century structural iron work, hidden below deck, has been painstakingly re-imagined, restored, and strengthened. The surviving Victorian Pavilion, one of two buildings on the pier, has been transformed into a glazed cafe-bar. The vast pier deck has been set aside for large-scale concerts, markets, and public gatherings. 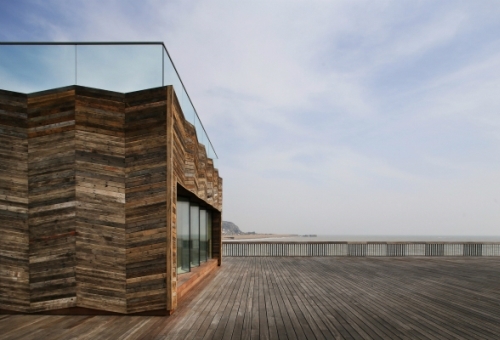 The new timber-clad visitors center building in the center of the pier has a viewing deck on its roof, providing a space for visitors to experience picturesque views along the coast and across the English Channel. The architects have used timber throughout the project, much of it reclaimed from the original pier. The reclaimed timber has also been used to create the pier’s striking new furniture that was manufactured locally. The vital importance of building sustainably runs throughout RIBA’s awards, and Hastings Pier deserves special recognition for its remarkable use of sustainable materials and positive social impact. The government has announced its call for evidence for the independent review of the Building Regulations – and has pinpointed architects for responses about fire safety. 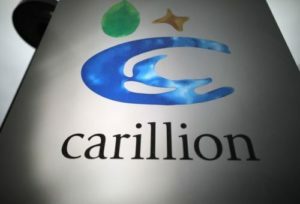 A document published by the Department for Communities and Local Government (DCLG) states that it is ’particularly interested’ to hear from those who use the current regulatory system – both on the parts that work well and need to be reformed, especially in the context of high-rise residential buildings. The department is encouraging respondents to answer ten specific questions (see below) outlined in the document, including one on whether architects are ‘adequately resourced’ to demonstrate and assess compliance with building regulations and ’if gaps exist how can they be addressed’. Architect and fire expert Sam Webb told the AJ that chair of the review, Dame Judith Hackett, had asked him personally to provide a response, which he is currently writing, and urged those in the profession to respond. Other questions in the call for evidence include whether the building regulations are ’clear and understood’ by those who use them, and asking what examples there are of good regulatory practice outside England. 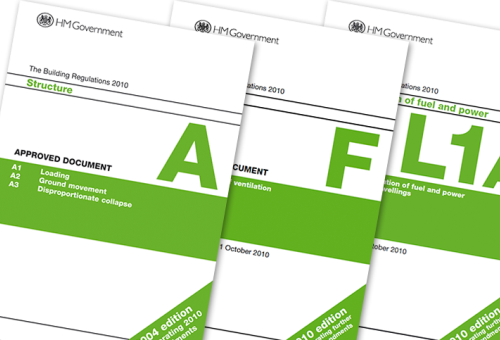 The DCLG comissioned an independent review of Building Regulations and fire safety in the aftermath of the Grenfell Tower fire. Last month, communities secretary Sajid Javid conceded that there could be a ‘systemic failure’ in the way tower block fire risk is managed in the UK, as the terms of reference for the review of the building regulations were announced. An interim report will be submitted in autumn 2017 and a final report submitted in spring 2018. The review will co-operate fully with the Grenfell Tower Public Inquiry, and Dame Judith Hackitt will review her recommendations in the light of the findings of the inquiry. Labour has vowed to create a new Department of Housing aimed at tackling the UK’s housing crisis, extend High Speed 2 to Scotland and ensure Crossrail 2 is built. In its 128-page fully-costed general election manifesto, launched in Bradford, Labour said it would increase spending by £48.6bn a year but raise an extra £48.6bn in tax. Among the pledges, the party said it will build at least 100,000 council homes a year and double the number of apprenticeships at NVQ level 3 by 2022. FMB chief executive Brian Berry welcomed Labour’s joined up approach on housing and skills. Labour also vowed to invest £250bn in infrastructure over 10 years, if elected. Other costed manifesto pledges include creating a National Education Service for England to close the skills gaps, supporting UK supply chains by targeting government support where there are gaps, committing extra investment in research and by capping energy costs and investing in new publically owned energy provision. Meanwhile the Conservatives have dropped Crossrail 2 from their manifesto, while the Party has also come under fire for raising the cost of hiring foreign workers and sticking to its pledge to cut immigration to the 10s of thousands. A report by the employer-backed Global Future says a net inward migration flow of 200,000 people a year is required to avoid the “catastrophic economic consequences” linked to Brexit. The Global Future report says the UK’s low productivity, ageing population and shortage of labour in key areas, such as construction, show that net migration of 200,000 will be needed annually. Meanwhile, Theresa May has pledged to build new homes to help bring the cost of buying and renting down to a more affordable level. Other construction commitments include pushing forward with HS2, a Northern Powerhouse Rail and expansion of Heathrow Airport. “Should she remain in Number 10, Theresa May must ensure that there is no major change to the anticipated pipeline of work which could unsettle the markets or deter investors. “CECA is particularly pleased that the Conservative manifesto includes a commitment to existing strategic investments such as High Speed 2, Northern Powerhouse Rail, and expanding Heathrow Airport. 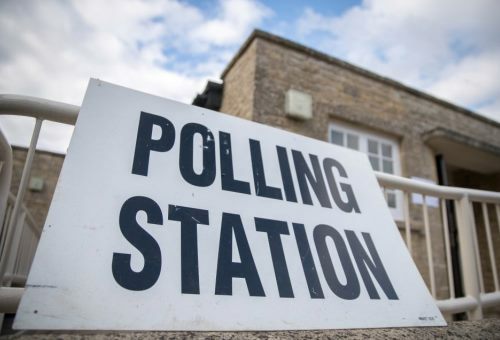 “At the same time, we believe there is scope for the Prime Minister to do more to provide clarity on major projects that are not named in the manifesto, such as Crossrail 2, the Swansea Bay Tidal Lagoon, and new nuclear power stations. “A revised house building target of 1.5 million homes from 2015 to 2022 ups the ante on housing delivery again, but these ambitions can only be delivered with an accompanying focus on creating a more diverse and innovative house building sector. New direct spending on house-building to help build 300,000 homes a year by 2022. 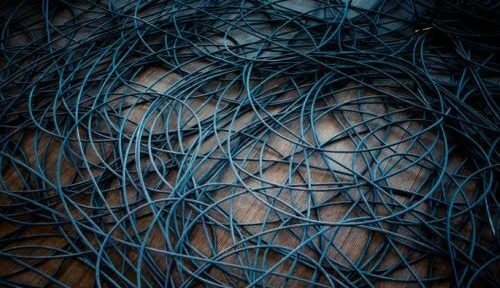 A programme of installing hyper-fast, fibre optic broadband across the UK. Capital investment in schools and hospitals to support capacity increases and modernisation. Significant investment in road and rail infrastructure, including a continued commitment to HS2, Crossrail 2 and rail electrification. Additional funding to bring more private investment into renewable energy. Construction materials prices have increased significantly over the past year, with the increases affecting all sectors of the industry. The Department for Business, Energy and Industrial Strategy (BEIS) Construction Material Price Index for all work shows annual inflation to February 2017 of 6.1%. Prices were falling month on month until January 2016 but have been rising steadily ever since, rising 3.9% in the six months since August 2016 — how much of this increase is down to the fall in the value of sterling is not clear. BCIS produce these indices, which measure overall trends in construction materials prices, for BEIS who also produce indices that track specific materials groups. Those indices are published in the BEIS Monthly Statistics of Building Materials and Components, which can be found on the BEIS website. The all-work and broad-sector indices are published in the ‘Indices’ section under ‘Resource Indices’ in the BCIS Online, BCIS Building Running Costs Online and BCIS Housing Online services. A new survey by the British Property Federation and property consultancy GL Hearn found that 80 per cent of applicants are now dissatisfied with determination times – the highest level ever recorded. This is despite the research finding that average determination times for major applications – at 31 weeks from submission – were no longer than last year. Figures from the Department for Communities and Local Government also show that 84 per cent of all planning applications in 2015-2016 were determined within the department’s 13-week target. The report said: ‘While the planning system is not slowing down, this year’s findings provide further evidence to suggest that the current targets are simply unrealistic for most major planning applications under current conditions.’ The study said that measures introduced to speed up determination were not working properly and noted that hopes that a greater focus on pre-application discussions would shorten the process had not materialised. ‘With increased emphasis on the pre-planning stage, it would be hoped that the proportion of applications brought forward to determination in an acceptable manner to gain approval would be on the rise,’ the report said. The survey found that more work is needed to make planning performance agreements (PPAs) – now used by more than half of major developments – more effective. It found that 60 per cent of applicants and 54 per cent of council planners are yet to feel any direct benefits in faster determination speeds or reduction in resource pressures. Nearly two thirds of applicants (65 per cent) said that PPAs should have a set timeframe, while 45 per cent of council planners called for the introduction of standard formats. The report also found that planning authorities within the ‘Northern Powerhouse’ approved 11 major applications per 100,000 residents, compared with just nine in Greater London. Ninety-seven per cent of local authority planners and 83 per cent of applicants said that the community infrastructure levy had either reduced or not changed development activity. The government is currently considering a report on the funding mechanism by former British Property Federation chief Liz Peace. Architects in Dubai are building the world’s first hotel with its own rainforest. Set to open in 2018, the Rosemont Hotel and Residences will boast over 2 million square feet of hotel, residential, and leisure space, an artificial beach, and a glass-bottom pool suspended above the streets of Dubai. 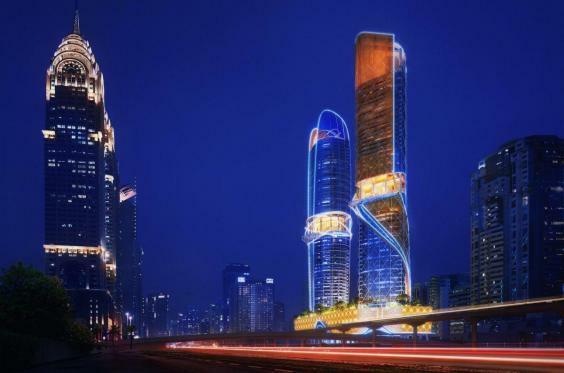 The hotel, designed by ZAS Architects, will be accommodated by a 47-storey tower that neighbours a twin tower of the same height housing 280 residential properties. All entertainment facilities — including the 75,000-square-foot rainforest — will be located in the “podium” at the base of the two towers. As a city made famous by artificial islands and record-breaking architecture, Dubai will no doubt welcome the $550 million (£423.6 million) development project with open arms as it continues to redefine luxury. The 2015 RIBA Stirling prize has been awarded to Allford Hall Monaghan Morris (AHMM) architects for Burntwood School. AHMM’s transformation of Burntwood School is said to reimagine a 1950s modernist secondary school campus for 2,000 girls and 200 staff. It was selected from a shortlist of six finalists. The Stirling Prize is the UK’s most prestigious architecture award and is “presented to the architects of the building that has made the greatest contribution to the evolution of architecture in the past year.” Among the criteria taken into account are a building’s design vision, innovation and originality, capacity to stimulate, engage and delight occupants and visitors, accessibility and sustainability, how fit the building is for its purpose and the level of client satisfaction. Now in it’s 20th year, the Stirling prize was last year awarded to Haworth Tompkins for the Liverpool Everyman Theatre. AHMM has been shortlisted for the award three times previously, for Westminster Academy (2008), Kentish Town Health Centre (2009) and for the Angel Building, London (2011). This year, however, is the first time the firm has won. The £40.9 million (US$63.2 million) project boasts four new four-story teaching pavilions, a new sports hall and a new performing arts building. The new buildings are said to be placed among the existing ones in such a way as to create a complete and coherent campus. Described by RIBA as “a very sculptural building,” Burntwood now has a range of education spaces, including conventional classrooms and interactive open spaces. AHMM employed double height spaces at the end of each corridor to bring natural light into the building and to create well-framed views. The firm is also said to have worked closely with an artist to produce large, colorful murals that act as both signposting and modern art. Get complete support from BAL with our M40 Specification Support service. Contact us now for free and technically accurate M40/M20 NBS Specifications.